After school today I was reminded of how 2 minds are (much) better than 1. 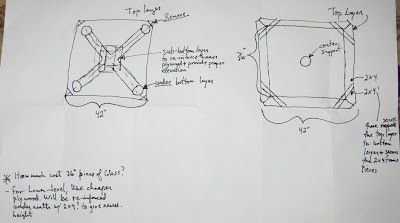 I've been trying to solve some intractable problems with the final design for the PVC computer table so I can get going on ordering and making them. Well, Ed and I sat down at the 1 prototype after school and launched off from where the 4 of us--Christen, James, Ed and I--left off 3 days ago: more great ideas but nothing solid. Eddie starts off, "So what's the problem?" I describe it, that there wouldn't be a way to put wood in the middle of the table top and we analyzed the problem and saw it wasn't one. It would have been interesting to somehow diagram the co-generation of ideas in our 45 minute session, somehow representing the way that the design would grow like an amoeba: extending and developing in 1 direction, then another and sometimes an appendage would withdraw/get erased, but then re-grow when one of us/we saw that it was actually the better solution. I got very happy as problem after problem got solved and a very nice solution grew. Now, there is only 1 problemcito that hopefully can be solved with the new prototype I'll be building. recognition of the key aspects of the bug.